The weather is glorious right now, sunny and very warm. Barbecues and eating outside are very much the order of the day. So, two very easy recipes to accompany a selection of meats from the barbecue: Potato Salad and Tomato Salad. I make potato salad fairly regularly, especially in summer. I’ve made many different styles over the years – some with mayonnaise, some with a vinaigrette style dressing, some with onion, some with egg. Potato Salad offers many possibilities. I’ve made the Prawn Cocktail Years version a good few times, but these days I tend to not follow specific recipe, but just do whatever the fancy takes me. Well, this time I was going to follow the recipe to the letter. I boiled the potatoes with some sprigs of mint in the water, and made a dressing: mustard, red wine vinegar, salt and pepper, whisked with a blend of olive and vegetable oil. I cut the potatoes into largish chunks and tossed them in the dressing, together with some chopped spring onions. And we’re done – what could be simpler? The tomato salad was a little more involved, but only slightly. The biggest chore was peeling the tomatoes. I hate peeling tomatoes. Oh well. Once peeled and cored, I sliced them thinly and laid them out on a plate. Then the dressing: I whisked together red wine vinegar, salt and pepper with some double cream. Once frothy and slightly thickened, I added a good shake of Tabasco and then spooned the dressing over the tomatoes. To finish, a sprinkling of chopped spring onions and then set to one side for twenty minutes before eating. The verdict: the potato salad was fine – nice tang with a good flavour. It was a perfectly decent potato salad. The tomato salad, however, was the stand-out dish for me here – that was really nice. 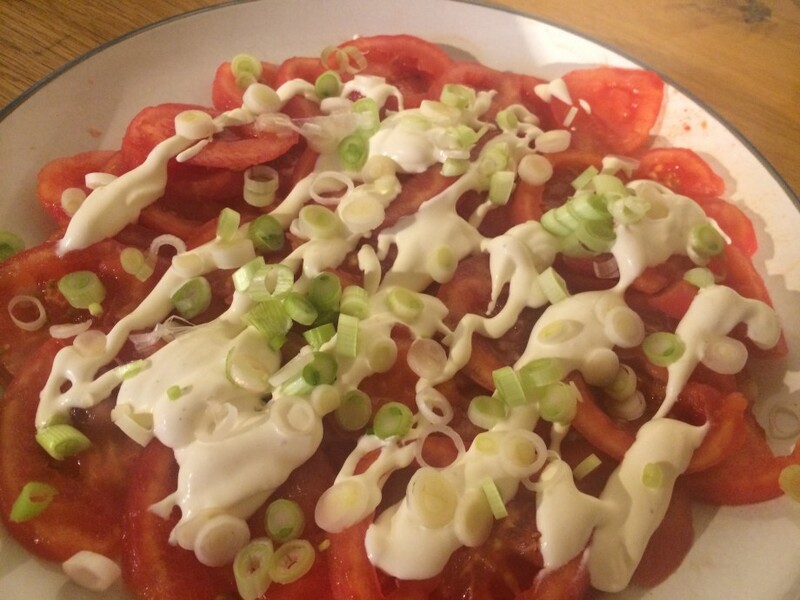 The tomatoes had a good flavour, and the tangy, creamy dressing complemented them perfectly. I’ll definitely do that again, I might even continue to peel the tomatoes. Well this might not be the hottest dish on the menu (in more ways than one) but it was still very nice. I do love tomatoes so it was easily going to be a winner for me. Dave even peeled them all first (something I’d never be bothered to do!). The dressing was very good. Creamy, but with a sharp tang that off-set the tomatoes perfectly. Very simple, but worth taking the time to do it properly rather than just slicing up some tomatoes as I would have done. This recipe for potato salad is a firm favourite in this house anyway. One Dave makes a lot (shame no one seemed to want to give us thousands of pounds to enable us to create it for some reason). 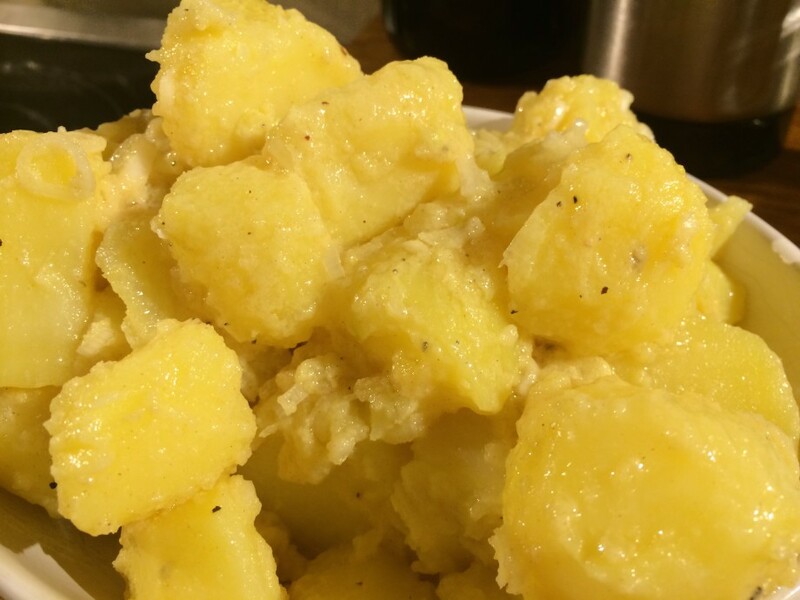 Unlike most potato salad which is creamy, this one has a buttery feel and a great zing of flavour. Nice and sharp to counter the fluffy potato. The tomato salad does look great, I would like to try it if I wasn’t so lazy to peel tomatoes myself! Mmm, might have to try that tomato salad. What’s the issue with peeling them? I presume you do the boiling water thing. Is it just too much faff? Ah, it’s just a faff. Yes, I do the boiling water thing, but I always either end up with chunks of skin that remain welded on to the tomato, or with the outer layer turning to overcooked mush because I left them in the water too long. I usually end up with burned fingers too.